Gene panels. Epilepsy gene panels have emerged as the first line genetic test for most suspected genetic epilepsies. Gene panels for childhood epilepsies are among the most common genetic tests ordered in a pediatric setting. While the role of gene panel testing is well established, the ideal design of gene panels remains an ongoing issue. A recent publication in the Journal of Medical Genetics provides additional evidence for the role of gene panel analysis in patients with genetic epilepsies. There are three aspects of this study that are particularly noteworthy. Figure. Number of patients with pathogenic variants in candidate genes. The study by Trump and collaborators examined 46 candidate genes in 400 patients with epileptic encephalopathies and developmental delay. SCN2A is the most prominent candidate gene in 3% of patients. The overall diagnostic rate was 18% with a rate of 40% in patients with onset of epielpsy before the 2 months. Modified from http://jmg.bmj.com/content/early/2016/03/18/jmedgenet-2015-103263.long under a Creative Commons Attribution (CC BY 4.0) license. Gene panels. The current study by Trump and collaborators analyzes the results of gene panels, including testing for deletions and duplications, performed in 400 patients with epileptic encephalopathy and patients with developmental delay. The study found a diagnostic rate of 18%, ranging at the lower end of what has been found as a diagnostic yield in gene panel or exome studies. However, this relatively low rate makes the current study credible – in fact, for studies reporting a higher diagnostic yield, we would be suspicious in 2016 that cases would somehow be pre-selected. Overall yield. In the current study, the low yield of 14% in patients with developmental delay without epilepsy and patients with later-onset epilepsy drags the overall diagnostic yield down. In patients with epilepsy starting before the age of 2 months, the diagnostic rate is almost 40%, a number that is in line with what we know from other studies. Here are three aspects of the study by Trump and collaborators that we wanted to share with you. 1 – SCN2A as the most common gene. This is the first study that shows SCN2A as the most common gene identified by gene panel analysis. Pathogenic variants in SCN2A were found in 11 patients, accounting for up to 3% of the overall patient population. This finding is not entirely new or surprising, but there are a few aspects that are worth discussing. First, we already know that SCN2A is a common gene for early-onset epileptic encephalopathies. However, in contrast to other genes with more clearly defined phenotypes, SCN2A phenotypes are often non-specific. In contrast, the absence of SCN1A as the most prominent gene is likely to be explained by the fact that few patients with Dravet Syndrome go undiagnosed in centers that have access to genetic testing. 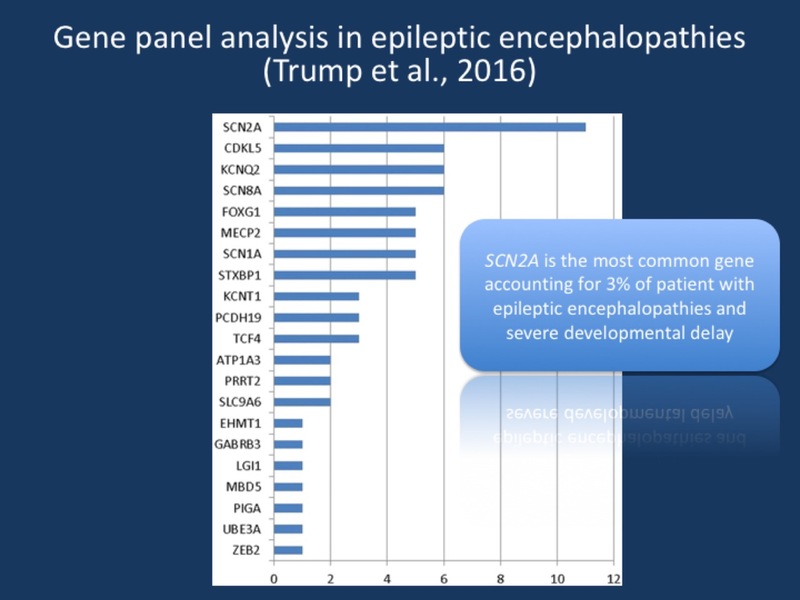 The study by Trump and collaborators nicely highlights the role of SCN2A in early-onset epileptic encephalopathies – in a patient with unexplained epileptic encephalopathy starting in the first few months of life, it is one of the most common genes to be identified. 2 – Clinical suspicion. In addition, the publication by Trump and collaborators provides an interesting estimate of the percentage of cases where the physician was “right on the spot” with the suspected diagnoses, which was true in individual patients with ATP1A3, KCNQ2, PRRT2, KCNT1, SCN1A, and ZEB2 mutation. These cases accounted for 15% of the patients for which a genetic etiology was eventually identified. There is ongoing debate on how good clinicians can be in identifying the correct gene in patients with severe epilepsies. On the one hand, there is the traditional clinical view that there is some degree of genotype-phenotype correlation that allows us to recognize the underlying genetic etiology if we phenotype comprehensively and carefully. On the other hand, there is a “genotype-first” philosophy that stipulates that phenotypes are non-descript and variable and that efforts should focus on genotyping rather than detailed phenotyping. This view is sometimes endorsed by researchers who primarily work with genetic or genomic data. The study by Trump and collaborators tries to reconcile these two viewpoints by putting a number on it. Yes, the phenotypes in early-onset epileptic encephalopathies are variable, but a skilled clinician is right in at least 15% of cases. 3 – 80/20 distribution. In the study by Trump and collaborators, the top 20% genes account for almost 80% of the positive findings. These genes include SCN2A, CDKL5, KCNQ2, SCN8A, FOXG1, MECP2, SCN1A, and STXBP1. This distribution may be due to the composition of the cohort studied. More than half of all patients had seizure onset before the age of 2 years and almost 20% (77/400) of patients had seizures before the age of 2 months. In this earlier group, the diagnostic yield was close to 40%. This may indicate that a significant proportion of early onset epileptic encephalopathies can be explained by a limited number of genes. The interesting aspect of this is that this distribution is in contrast to what we have found previously in larger studies that point to a few “heavy hitters” with a long tail of heterogeneous genetic etiologies following. The study by Trump and collaborators indicates that we should think again – maybe in some subsets of patients, the genetic etiologies are less heterogeneous, which would allow for a meaningful rapid and targeted screening. Genes analyzed. The genes analyzed in the study by Trump and collaborators included the following 46 genes: ADSL, ALG13, ARHGEF9, ARX, ATP1A3, ATRX, CDKL5, CHD2, CHRNA4, CHRNB2, CNTNAP2, EHMT1, FOXG1, GABRB3, GRIN2A, GRIN2B, KCNQ2, KCNT1, KIAA1279, LGI1, MAGI2, MBD5, MECP2, MEF2C, NRXN1, PCDH19, PIGA, PLCB1, PNKP, POLG, PRRT2, SCN1A, SCN2A, SCN8A, SLC16A2, SLC25A22, SLC2A1, SLC9A6, SPTAN1, STXBP1, SYNGAP1, TBC1D24, TCF4, UBE2A, UBE3A and ZEB2. There are some genes on this list that are interesting additions to the usual list of candidate genes: EHMT1, KIAA1279, MAGI2, SLC16A2, UBEA2. Also, some of the more recent genes were not included, such as DNM1, GABRA1, and CACNA1A. This is what you need to know. The current study by Trump and collaborators is the most recent gene panel study in the field. This study confirms a high diagnostic yield of up to 40% in patients with early onset epileptic encephalopathies, reinforces the notion of SCN2A as one the most common candidate genes and indicates that a small number of genes account for the majority of identified cases. In addition, the study provides us with an estimate of our clinical precision, suggesting that the underlying genetic etiology can be suspected clinically in at least 15% of patients. This entry was posted in 2016, SCN2A and tagged ATP1A3, gene panel analysis, KCNQ2, KCNT1, PRRT2, SCN1A, SCN2A, ZEB2. Bookmark the permalink. Why do you think SLC13A5 was not included? apologies for the late reply. Not being completely familiar with the design of the study, of course, I would assume that this panel was built prior to the discovery of this gene. In either case, SLC13A5 is very rare and there is an ongoing discussion on whether these genes are better represented on a panel or whether exome would be more appropriate.